Bypass shutter track system with hidden tilt rod feature. 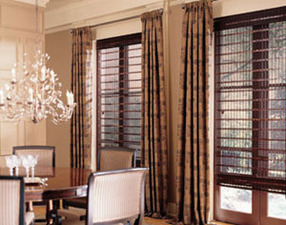 When choosing window fashions for your home, start with the mood or ambience you are trying to create for your room. What type of furnishings are you leaning towards? The types of rugs and accent colors all come into play when you are looking to create a mood. If you want warmth, go with natural woods or comforting fabrics that accent your primary colors. There’s nothing cozier than natural stained wood shutters or rich textured fabrics in a family or living room. In this article we will focus on natural products. Over the years we have seen different types of window fashions come and go. Remember the woven woods of the seventies in Harvest Gold and Avocado Green to match your appliances? I grew up with these and remember them well. Fine custom draperies also come in and out of style as do the prints and textures that go with them. The one product we have not seen many changes in is shutters. We have gone from the small 1 1/2” louvers all the way to 4 1/2” plantation style shutters but the classic look of custom wood shutters continues to be in style, especially today. Shutters come Natural woven grass shades for a casually elegant look.in wood, vinyl, Poly, MDF and other types of materials. When choosing a product type for you shutters, educate yourself a bit on the various products to insure you get the look you want. If you want something a bit more unique, try the hidden tilt rod or clearview feature. This will give you a more contemporary look, more view without distraction and if you order 4 1/2” louvers, you will have a lighter, brighter room. Wood: Basswood is the most common type for shutters. You can’t go wrong with a quality basswood shutter. If you are installing them in a hot sunny window, you may want to consider a synthetic product which will hold up better in the hot environment. Wood will last for many years but just like your furniture, you need to care for it. Poly: The advantage to poly is durability and longevity in a hostile environment i.e. hot sun, kids, salt air. Poly shutters also do better in wider widths that we see in many windows today. Also with poly shutters, you won’t see the staples loosening up as much as with wood over time. 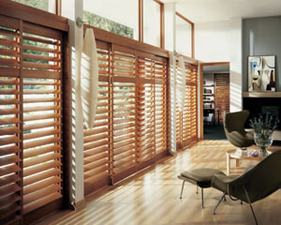 This type of shutter varies in price and in some cases will be a bit higher than wood and in other cases less expensive. The quality, look and manufacturer of this product will dictate the price. Basically, the less it looks like poly, the more it will cost. Natural woven shades with fabric side panels Vinyl: We like vinyl shutters for high humidity environments such as steamy bathrooms. Many homes have windows in the shower and this type of shutter works well in this application. Unfortunately, you won’t get the rich natural look with vinyl as you do with wood. Specialty Shapes: Shutters are the one product that can be made to cover the odd shaped window. Whether it is an arch, rake top, or circle, it can be covered with a shutter. Natural woven shades have come back with a vengeance over the past few years. Many companies are manufacturing shades utilizing reeds, grasses, bamboos and a host of other natural and synthetic fibers. This type of shade can be used by itself or as a back drop to soft custom valances or side panels.The result is a very warm yet fashionable statement for your room. Hunter Douglas Window Fashions is the leader in innovation, quality and fashion. Their Provenance Natural Woven Shades come in a variety of colors, fabrics and styles to help you create that mood you are seeking. Wovens will also enhance the rich wood tones in your room. Typically they have a casual look but in the right application, can be very elegant! Classic white 3 1/2" plantation shutters.Conrad Shades are the most unique in this category. Their product line utilizes some very unusual natural fibers. Natural arrowroot, flax and other renewable fibers are hand tied and prepared for the loom. Shades and drapery panels are individually hand-woven to size rather than cut from rolls. Even the edges are woven! If you are looking to wow your friends, look at Conrad but be prepared to pay the price for this extraordinary product.